In this option, you provide an idea about what type of design you need, what colors you like, and other web site designs you wish to emulate. 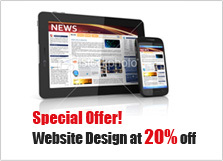 We will create a brand new website design to you software purchase. In this option, you provide an idea about what type of design you need, what colors you like, and other web site designs you wish to emulate. We will create a brand new custom design and integrate it with your software purchase.